I almost exclusively use the home page as my means of seeing what new content has been posted on HMN since my previous visit/page refresh. This entire post presupposes that good discoverability of new posts/threads from the home page is one of the page's primary goals. Recently, I've been finding the home page somewhat inadequate from a discoverability standpoint in that a fairly large percentage of the time, I find out about new interesting threads when they're posted by the HMN twitter account (after I've already checked the home page). 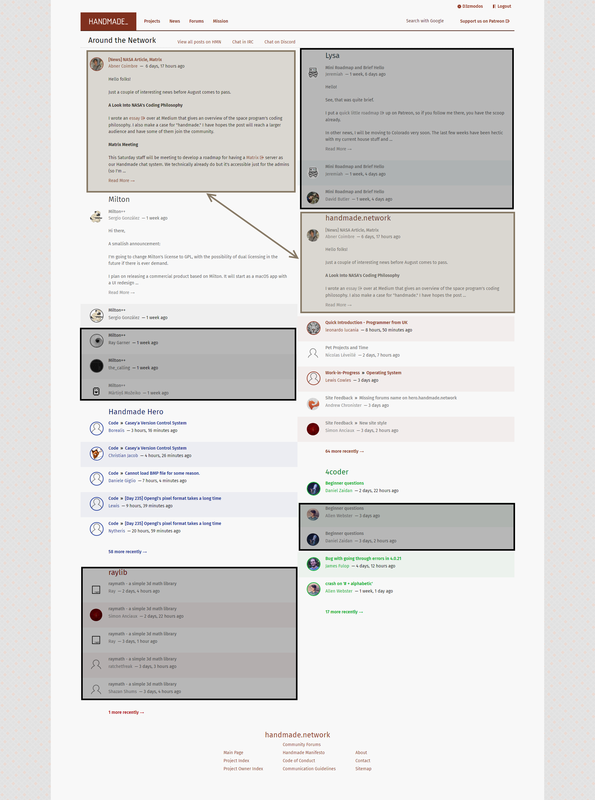 Now obviously this is bound to happen because the home page is not attempting to display every active forum thread. However, I get the feeling that this happens even when I've read a lot of the threads that show on the home page, and when the threads on the home page are older than others that are not shown. I am certainly aware to the fact of this could just be my perception and could be very much incorrect, but even if that turns out to be true there may be some room for improvement. The most obvious seemingly-unnecessary consumption of vertical space is the duplicated HMN News announcement/post (highlighted in light-brown). I understand that we show the latest news in the large block on the left, but surely it can then be excluded from the handemade.network forum preview on the right? A few more subtle possibly-unnecessary uses of space are highlighted in black. In the case of Lysa and raylib, I've read all of the suggested posts for that project (and in Lysa's case, there aren't any unsuggested posts), so I would expect that there isn't much use in those projects getting their own sections on my homepage. In the case of Milton and 4coder, I've already read some of the posts being suggested (but at least there are posts that I have not, so its less of an issue). In total if you count both columns, the above screenshot comes to approximately 4200 pixels of vertical space. If we assume that the larger HMN News suggestion (in the top-left) is the more important one, then we ignore that and all of the remaining highlighted areas amount to around 1600 vertical pixels, or ~38% of all the available space! Those are some good points, and definitely something we'll have to look into improving going forward. Thanks for the feedback!